This is the biggie - Australia is HUGE, so my question is...how do you plan a trip there when there is so much to see and do?! First things first, learning a little about the country itself; Australia is a place I hadn't really thought about visiting. I mean, I'm a BIG Home & Away fan (yes, the sad truth!) but beyond that, I know nothing. So, are you ready? 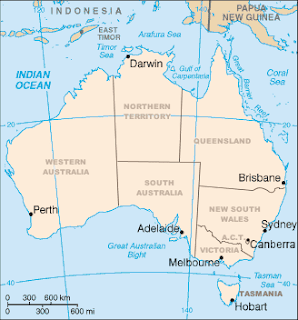 Australia is split into six states - Western Australia, South Australia, Victoria, Queensland, Tasmania and New South Wales. There are also two mainland territories - Capital Territory and Northern Territory which function as states. I'll be honest, I haven't got a clue beyond that. We'll be flying from Bali to Perth then, from there, we have nothing planned. We will be heading to Melbourne as that's where we will be settling to try and find work - I have family friends there and Vicky also has a few friends there. We'll be heading to Sydney for New Year as well. So who knows - is there anything any of you can suggest for Australia? I have my years working visa now so the world's my oyster really! Last night, I got a map and a highlighter pen and tried to figure what where and what I wanted to see. I came to realise, Everywhere I want to go is on the coast - Perth, Cairns, Adelaide, Melbourne, Canberra, Sydney, Brisbane...so this leads me to wonder - what on earth is there to see in inland Australia?! I know there's Ayers rock but apart from that, I feel pretty ignorant to the beauty Australia has to offer. This is a to be continued post; I can't possibly go this uneducated on Oz simply thinking a trip to Summer Bay will suffice!